Home / Antifa / #Seattle #Milo Shooting: Shooter of unarmed anti-racist walks free; Authorities silent. The victim is an anti-racist and anti-fascist activist, and member of the Industrial Workers of the World (IWW), and the IWW General Defense Committee (GDC). His lawyer has confirmed that he was there to protest Milo Yiannopoulos’ hateful speech and violent incitement. He had been seen de-escalating conflicts between protesters and counter-protesters before he was shot. He remains in Harborview Hospital. Social media activists allege the shooter is a well-known local right-wing gun activist who sent Yiannopoulous multiple facebook messages that evening. This person claimed in those messages that a protester had stolen a beloved “Make America Great Again” hat, and requested a new, autographed one from Yiannopoulos. In these messages he claimed a protester had ‘sucker punched’ them. Multiple witnesses have reported that this person appeared drunk that evening, and had aggressively and repeatedly sought confrontations with protesters. This behavior can be seen on videos released by the Southern Poverty Law Center, and others. Media sources have reported that the suspect has claimed they shot in self-defense and that they originally thought that the person they shot was a ‘white supremacist,’ but UWPD deny these reports. The reporting of these sorts of unsubstantiated claims has clouded the facts, and allowed undue credence for the right-wing narrative of fear. People have questioned the University of Washington administration’s handling of this situation. UW administrators justified the event on the basis of the principle of freedom of speech; it is unclear however that the administration would permit self-proclaimed nazis to speak on campus and encourage the genocide and ethnic cleansing of the United States. We question why the administration permits people who have merely rebranded themselves as members of the alt-right to encourage similar violence against our fellow humans. 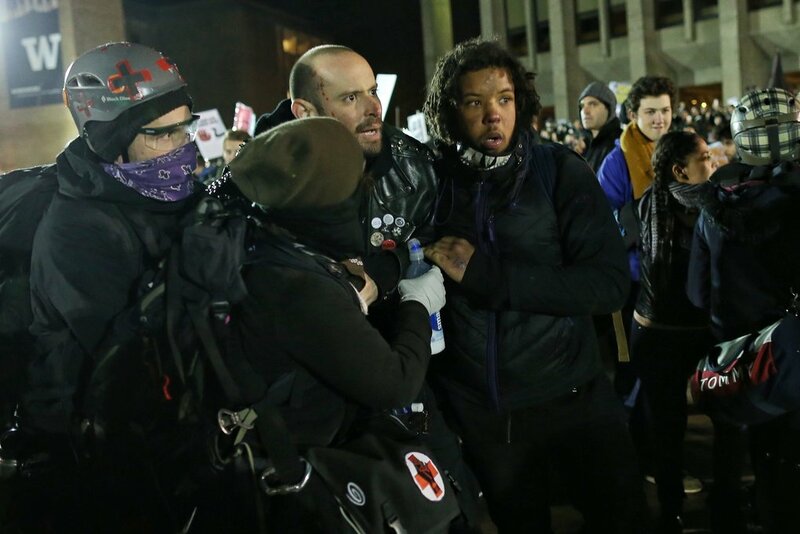 UW President Cauce’s statement denied administration responsibility, and offered no support, condemning ‘violence’ in general and reaffirming support for the event’s approval, as well as the police handling of the situation. Multiple press accounts from witnesses indicate that the police made no serious attempts at crowd control that evening, and were unprepared for the event. At the same time, observers have questioned the prosecutor’s unwillingness to charge the shooter, even after they turned themselves in. Our comrade has expressed his empathy for the shooter and his desire to engage in a restorative justice process rather than cooperating with a criminal prosecution. This indicates his deep opposition to the violence of the police and the state. The police’s complicity with the shooter indicates their willingness to protect those who create violence. There is a double-standard for violence in America: right-wing activists may shoot protesters with impunity. We appear to be in a period when the right wing can murder unarmed protesters and claim self-defense. This was the supposed defense of the white supremacists who shot five people in Minneapolis at a protest against police murder. These violent right wing activists will even call us the ‘nazis.’ As they have done in this case, the media will collaborate unintentionally. Finally, we are disturbed by the total silence from Seattle’s political establishment. We expect conservatives to ignore or even celebrate violence against us. However, the silence and lack of support from liberal, progressive, and radical members of the city council – especially socialist Kshama Sawant – is damning. Our comrade continues to recover, and we are deeply grateful for the support shown him by generous people all over the world. His pain and sacrifice should not be in vain: we call on all people opposed to fascism and racism to demand accountability from the UW, the police, and the politicians. While we hold them accountable, we must also take responsibility for our own collective safety. It is clear that the police and the politicians have no interest in our safety. Americans often like to say ‘there is no room for racism.’ It is past time to move beyond statements, and make it a truth. Previous post: #Squat: Autonomous spaces in #Slovenia under attack, support the struggle! Podcast: Interview of Counter Protester Shot at UW in Seattle | Enough is Enough!